The third annual event takes place today from 2 to 9 p.m.
Like No Udder’s Karen Krinsky. Photo by Casey Nilsson. I don’t know about you, but nothing swivels my head and catches my attention quite like the phrase “free ice cream.” That’s exactly the phrase you’ll be hearing all day at Like No Udder on Tuesday, April 9 during its third annual Free Cone Day. But this isn’t your ordinary ice cream shop. The best vegan ice cream purveyor in Rhode Island, Like No Udder started out as a purple-polka-dotted ice cream truck, serving vegan treats during the hot summers in 2010. In 2016, they opened the doors of 170 Ives Street and have been serving the public diligently ever since. This Tuesday, from 2–9 p.m.. (or whenever they run out), they’ll be serving up those vegan treats free of charge. They expect to dole out more than 700 cones. Free Cone Day is popular with large ice cream chains, but it might be harder for small, local businesses to offer such a thing. 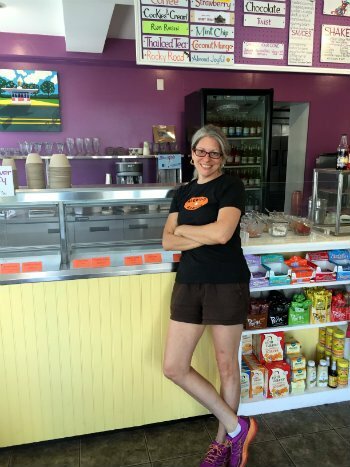 Via crowdfunding and their habit of “paying it forward,” though, this small shop in Providence is able to rival some of the big chains with its delicious vegan soft-serve and hard serve treats that those chains might not be able to provide. Free Cone Day takes place at Like No Udder on 170 Ives St. in Providence from 2–9 p.m. or while supplies last. Get in line early!